Today is the feast day for Alexander Yaroslavich Nevsky (Episode 5) in the Russian Orthodox Church. Nevsky is one of the heroes of the early years of Russian history. He was both Grand Prince of Novgorod and Vladimir during the 1200’s. From 1228 to 1233, Alexander Yaroslavich ruler Novgorod together with his brother Fyodor. When his brother died in 1233, Alexander enlisted his brother Andrei to help expand Novgorod’s lands. Quickly they began to encroach upon Finnish lands which caused the Swedes, Teutonic Knights and Livonian Swordbearers to challenge Alexander. In 1240, the Swedes attacked at the Neva River but were defeated by Alexander’s small army. This is how he came to acquire the name Nevsky. After winning the battle, he quarreled with the citizens of Novgorod and left, heading to Pereyaslavl Zalessky. In short order, a German army seized nearby Pskov and threatened Novgorod which cause the populace to beg Alexander to return. After coming back in 1241, he began to recapture lost territory including Pskov. In 1242 the famous “Battle on the Ice” occurred between Nevsky’s army and the main force of the Teutonic Knights on Lake Peypus (aka Lake Chud). This legendary battle increased Alexander Yaroslavich’s stature among his people but especially with the Khan of the Golden Horde. The Mongols admired military courage so when Alexander went to Sarai to visit Khan Batu he was sent all the way to Mongolia to see the Great Khan in Karakorum. There, he received the title of Grand Prince of Kiev and of all the Rus in 1249. He served the Mongols well, often times putting down rebellions within his lands. While some felt that this was a traitorous act, he was able to prevent mass executions which was the preferred method of meting out punishment by the Horde. After his fourth visit to the Golden Horde in 1262, Alexander Nevsky fell ill. On his way home, he became a monk and died on November 14, 1263 in the town of Gorodets. 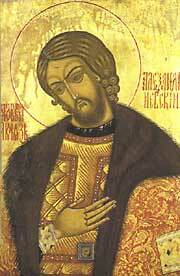 He was canonized as saint in the Russian Orthodox Church during the reign of Ivan IV (the Terrible). Hi, I'm Mark Schauss and I an internationally known lecturer on environmental and nutritional health issues having spoken in North America, Asia, South America, Europe and soon in Australia. I also have a deep interest in history, especially Russian history because of my heritage through my mother's side of the family. Another large influence on my love of Russian History is my college professor the late Dr. Paul Avrich. His classes were always full and his passion for history was amazing. I wish he could have found out about my podcast before he passed away.